Thereupon he himself locked up the room, and left her in it alone. So there sat the poor miller’s daughter, and for the life of her could not tell what to do, she had no idea how straw could be spun into gold, and she grew more and more frightened, until at last she began to weep. In case you are not already familiar with the story, this is the beginning of Rumplestiltskin. No, he does not demand Cinderella’s child like he did in ABC’s Once Upon a Time, but he does demand the miller’s daughter’s firstborn when she has become queen. If you’d like to read the complete story, click here to visit a great fairy tale website that has the story and all sorts of interesting facts. 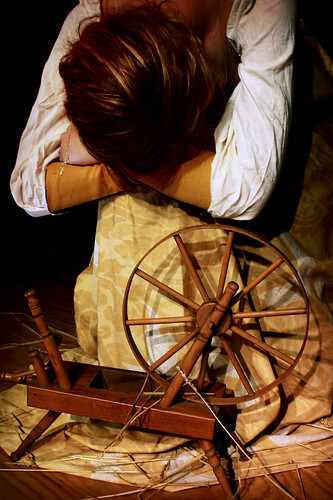 In the process of capturing this photo, my lovely model Olivia wept many tears and practically threw my little spinning wheel across the room when she discovered that she also lacked the ability to spin straw into gold. Sad times. The Rumplestiltskin Problem by Vivian Vande Velde is an entertaining and easy read—it’s her collection of different versions of the same story. I would recommend it just for the introduction!